Chewy sugar cookies dipped in dark chocolate and covered with crushed peppermint patties, with a melted marshmallow sandwiched between. The perfect holiday cookie treat! 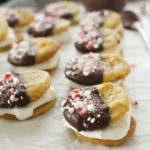 Make these marshmallow cookies for your next holiday party or cookie exchange! Pre-heat your oven to the temperature on the cookie package. Bake according to package directions, but remove one minute early. Let cool. Melt the melting chocolate in the microwave (package usually says between 15-30 seconds). Dip 12 of the cookies into the chocolate halfway, cover with crushed peppermint, and let cool on a cooling rack. Once they've stopped dripping, place them in the fridge to solidify. Once the chocolate has set, place the other half of the cookies back into the oven with a marshmallow in the center of each. Bake for 2-3 minutes until the marshmallow gets wobbly. Remove from oven and press down with a spatula. Place a chocolate covered cookie on top and press down.